On August 13th 1836, just 6 months after Hudson had been created as a colony by the Illinois Land Association, Hudson Illinois was laid out by Horatio Petit. Like many areas of the United States, Hudson experienced hard times starting in 1837 and it wasn't until the 1850's when the purchase of land began for the railroad right of way through Hudson that the community began to thrive. The past 178 plus years has shown growth of agriculture. organizations, churches and schools and all have built on the strong foundation of our early settlers. "Product of the Prairie, Pride of the People"
Hudson, Illinois was laid out by Horatio Petit on August 13, 1836. It was one of eight towns founded in McLean County during the great real estate boom that swept through central Illinois between 1835 to 1837. It also shares the distinction of being one of two "colonial" settlements in the county; the other was the Rhode Island colony in the southwestern part of the county. Traditional Sources say that the town was named for the town of Hudson, New York in Columbia County which, so it was said, was the home of its early settlers. However, in her Book on the Hudson, Ruth Biting Hamm has pointed out that, while some settlers were from Queens County, New York, none came from near the town of Hudson. She suggests that it is more likely town was simply named for the Hudson River. Hudson was created by the Illinois Land Association who developed it as what was then called a colony. Colonial schemes such as this were popular in the 1830s. Rather than settlers migrating individually and buying land on their own, participants in a colony would band together, pool their money, appoint a committee to select a large tract of land, which would then be divided among the participants. Such colonial developments do not imply that the group had any common social or religious agenda. Sometimes, the people involved came from a single area but often, as was the case in Hudson, they were clusters of individuals who had no connection forming the colony: several of the founders of Hudson were from New York, but others were from Maine, Massachusetts, Pennsylvania and Illinois. 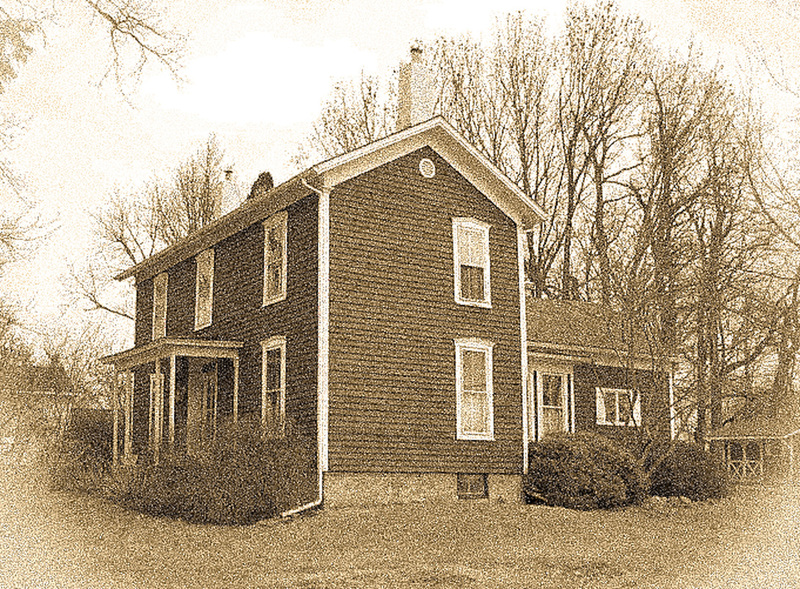 The Illinois Land Association was formed in February 1836 in Jacksonville, Illinois. Each participant would contribute $235 to the common pool and would receive four kinds of property: Three lots in the main part of the town; one out lot (see below); 160 acres (650,000 m2) of prairie land for farming; and 20 acres (81,000 m2) of timber for fences, firewood, and building material. The association also anticipated a profit from the sale of untaken land and this would be shared among the participants. An executive committee selected the land, supervised the laying out of the town, and presided the drawing of lots to select the division of the property. The 1836 plan of the town of Hudson was interesting in several respects. First, most central Illinois towns of the 1830s were laid around a central Public Square; but Hudson had none. Second, the town of Hudson had both "in lots" - and "out lots." The "in lots," formed the core of Hudson and were standard blocks of lots like any other town. These were surrounded by a ring of "out lots," which were slightly larger, but still part of the original town plan. At Hudson the "out lots" differ in size. The tradition of in and out lots goes back for centuries in New England, where farmers were reluctant to consign their livestock to locations far removed from the town center. These 'out lots" should not be confused with the far larger tracts of farming land that were also assigned to each settler. It is unclear why this out-of-date design should have been adopted at Hudson. The original town contained 30 blocks of "in lots" each of which contained eight lots; because each participant received several lots Hudson, even today, the houses in the older part of town are often much more widely spaced than in other towns founded at the same date. Broadway was designed as the main street of Hudson, and because of this was 120 feet wide, while other streets were only 80 feet wide. Eventually the "In lots" and the "out lots" came to be used in much the same way, as residential building sites. movies were shown in the building, dances were held, basketball games were played, in the building, medicine shows were put on and a number of groups still continue to meet in the Town Hall and also have other activities, dinners and events. Elbert Green Hubbard (June 19, 1856 – May 7, 1915) was an American writer, publisher, artist, and philosopher. Raised in Hudson, Illinois, he met early success as a traveling salesman with the Larkin soap company. Today Hubbard is mostly known as the founder of the Roycroft artisan community in East Aurora, New York, an influential exponent of the Arts and Crafts Movement. The boyhood home of the famous author and philosopher Elbert Hubbard, built in 1857 still stands at the corner of Broadway and Walnut Streets. Melville Elijah Stone (August 22, 1848 – February 15, 1929) was a newspaper publisher, the founder of the Chicago Daily News, and was the general manager of the reorganized Associated Press. With the arrival of the railroad the success of the town of Hudson was assured. The surrounding tall grass prairie proved to be some of the most fertile agricultural land in the world. Initially the crops were corn and oats, produced together with a great deal of livestock. In the 1850s and 1860s settlers came in great numbers. By the mid-twentieth century livestock production had slowly begun to decline and soybeans had replaced oats as a second crop, but the great fertility of the soil remained. Hudson's growth was slow but steady. In 1873 the town was incorporated. By 1883 telephone service had come to the town, and in 1912 the first electric lights were installed. In 1916 a new town hall was built. In the late twentieth century, because of its proximity to Bloomington and Normal, Hudson was becoming increasingly popular as a residential community. In 1992 Interstate 39 was completed, connecting Hudson with El Paso and Normal. The Hudson History Club meets from March - November on the third Monday of each month at the Hudson Public Library. The club holds a couple of special events each year including a history tour in June and a picnic in October. The club's main purpose is to collect information and items pertaining to the history of Hudson for addition to the Hudson Public Library History room. It is because of this club's dedication to preserving Hudson's history that we can share our communities history with current and future generations.